I’ve fallen behind. Harrow County is one of the few books that I tend to read the moment the book is available, but I’ve allowed a whole handful of other issues keep me distracting. It’s obviously catch up time; I owe that to Cullen and Tyler, two studs that bat a thousand on a regular basis. I think I’ve prefaced my last few Harrow County reviews. Not. Enough. Time. In. A. Day! Getting into issue number seven we see that the conflict continues develop, and the conflict centers on Kammi, Emmy’s twin sister, who’s a conniving little lady. Unlike Emmy, Kammi is happy to embrace her inner dark side, and it could bring about the downfall of a small community. She’s powerful, but apparently she never read a Spider-Man comic, she’s completely abandoned responsibility. As the pages of issue seven fly by we see Kammi venture out into the woods and one by one she recruits the dark creatures that hide in the swamps, nestle in dilapidated sheds and use the trees as a camouflage safe haven. 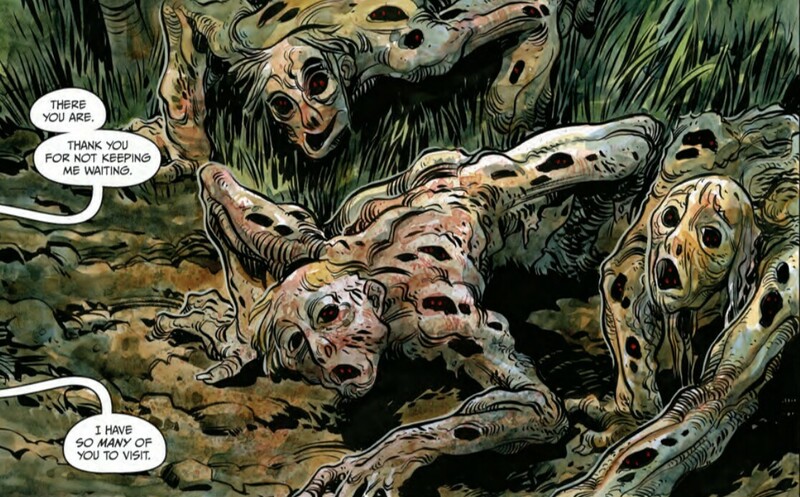 She frees them all of their binds, and plans to once more bring terror to Harrow County. The innocence that Kammi projects is disarming. She could easily be a heroine, as she conducts herself with more than just confidence, she’s polite and seemingly thoughtful. But it’s all a ruse, and the one person in Harrow County that knows it with certainty is Emmy, Kammi’s twin of equal power but lesser maliciousness. As the final pages barrow toward us we get a brief taste of the inevitable showdown between Emmy and Kammi. Two witches tangling in the marshes of a forgotten village is one thing. It becomes an entirely different ball of wax when one of those witches has a horde of demented entities by her side. Will we see the battle royale in issue number eight? Part of me hopes so. The other part hopes this particular arc grows into a sprawling epic storyline. As I’ve said a half a dozen times already, Cullen Bunn and Tyler Crook are nothing short of dazzling, and Harrow County is a book that makes the comic fan’s world just a little bit better.